Anthologies have a lot going for them. For one thing, unlike a novel, you can read selections at random. For another, the range of subjects and writing styles accommodate a variety of reading tastes and inclinations. 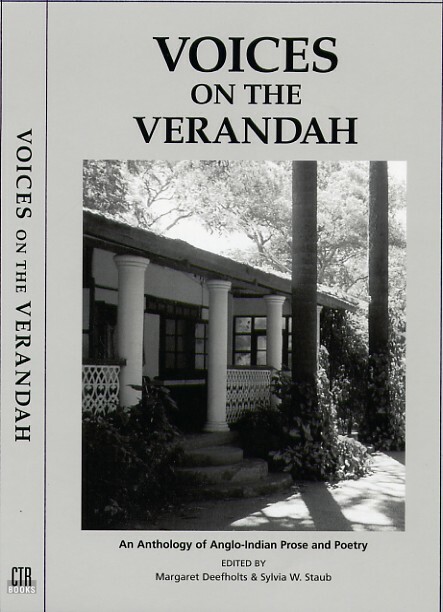 Voices on the Verandah* is a prime example of an anthology which offers an interesting mix of reading material. As a literary collection of tales and poetry, written from a uniquely Anglo-Indian perspective, the short stories range from nostalgic to humorous, and the poetry selections run the gamut from wistful to jaunty. The book evolved from a world-wide contest sponsored by Blair Williams of CTR Inc. in 2003. His object was two-fold: (a) to publish a collection of work showcasing Anglo-Indian cultural values and way of life; and (b) to raise money for the Community's less fortunate members in India. Two prizes of US$500 each were awarded: One for prose and the other for poetry, and the contest drew an overwhelming response230 entries in total. Voices on the Veranda is a distillation of the best of these submissions: 22 short stories and 29 poems, and includes, as an added bonus, a "Guest Contributors" section featuring the work of distinguished Anglo-Indian writers such as Ruskin Bond, William Dalrymple and Russell Lucas. The two award-winning contributions are riveting: Butterfly by Kathleen Cassity, an Anglo-Indian who lives in Hawaii, is piquant and deeply moving. The poem Calcutta '94 by Darryl Earle poignantly captures a real-life encounter with an elderly Anglo-Indian woman on a Calcutta sidewalk. You'll find that some tales in Voices on the Verandah have a romantic simplicity, others are dramatic and have a twist to their tail (or is it "tale"?!). Most of the characters strut across centre stage, while others play supporting roles within a larger framework. The stories, while reflecting the Anglo-Indian ethos, are set against different backdropsIndia, Britain and the USA, and each of them is written from a strongly individualistic viewpoint. For example: Patricia Redmond's Shirley Temple is a funny, heart-warming story about a relationship between a little servant girl and her employer's daughter, "Missy Baba"; The Cat (Harry MacLure) is a spine-chilling supernatural tale, while The Wrench (Roger Flory) is macabre. After the Raj, by Sylvia W. Staub is a story about three elderly and feisty Anglo-Indian women, as they meet once a year in post-Raj England to chat, reminisce and catch up on one another's lives. Patricia McGready Buffardi in Papaya Sunrises, Mango Sunsets goes back in time to explore the life of a retired railwayman, just before India's Independence. The second section, "Songs on the Verandah" showcases the work of Anglo-Indian poets. It includes poems of introspection and lyrical tributes to romantic love, lost dreams and the glories of Nature. There are also impish (and fondly reminiscent) pieces such as Daphne Ruth Clarke's I Remember When, May I Have the Pleasure, and Boodhi-Ayah. Pam Moore's The Eyes Have It is a romantic ballad, and her The Final Sum is gently ironic. Several poems touch on the immigrant experience, while others probe the Anglo-Indian identity: Chee-Chee (Kathleen Cassity), Hybrid Child (Priscilla Corner). It is impossible to review all the selections, particularly since they vary so greatly in subject and mood, but you'll discover your own favourites among this large pool of Anglo-Indian talent. The "Guests on the Veranda" section features the work of some of our most celebrated writers. Ruskin Bond is an Anglo-Indian literary icon, and needs little introduction. His tale, My Father's Trees in Dehra, (an autobiographical sketch,) is wistful evocation of his boyhood in Dehra Dun. William Dalrymple's White Mischief is an engrossing essay about Anglo-Indian life in eighteenth century India, and the discovery of his own mixed-blood heritage. Russell Lucas' lightly risqué tale, The Pathan's Girl, is set in 1930s India; it recounts, in the style of Somerset Maugham, an affair between an Englishwoman and a young Pathan. Lionel Lumb, Ann Lobo, Joyce Mitchell, Gloria Jean Moore, Reggie Shires, and Sylvia W. Staub, all weave strands of colour and depth into the tapestry of life in Anglo-India. Their contributions are a fitting finale to an anthology which deserves pride of place on your bookshelf. NOTE: Voices on the Verandah is the third in a series of booksthe first two being Anglo-Indians: Vanishing Remnants of a Bygone Age (Blair Williams) and Haunting India (Margaret Deefholts)that have been published by CTR Inc Publishing. with a view to raising funds for charityand in order to establish a body of Anglo-Indian literature for our own future generations, as well as reference material for sociologists. The next book, The Way We Were is slated for publication in 2006. Submissions are welcome; see contributors guidelines. *Gross proceeds from Voices on the Verandah will go to the CTR Relief fund. Publishing costs are privately borne.